Poster Pals was founded in 1981, initially as a publisher of posters and visual aids for teachers of French-as-a-second-language to fill a need for teachers who were experiencing a lack of commercially available materials. In the 1990’s, collaboration began with teacher authors to create reproducible units of study and student story books to match the Core French curriculum, specifically in Ontario and generally in the rest of Canada, including the French curriculum of English language schools in Quebec. 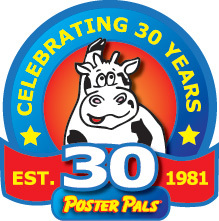 Today, Poster Pals has grown to include selling to many stores supplying educational materials and other retailers, such as educational catalogue companies. In addition to the Canadian market, you will find our products in the U.S., U.K., Australia and around the world. Poster Pals continues to create and publish new materials. We currently have over 500 French and Spanish products and this list continues to grow. After 30 years in business, our products continue to be designed to match the curriculum of core and immersion programs at the elementary and early secondary school levels to fill the unique needs of those programs.